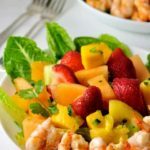 This Southwestern Fruit Salad with Tequila Lime Dressing and Prawns blends fresh fruit from Mexico with fresh seafood from the Pacific Northwest. Denis and I love to travel. In his words, “It’s what we do best.” While we like the routines we follow in our daily lives at home, we crave the sense of adventure that traveling allows. For me, this adventurous spirit extends to having new food experiences as well. When I think of the food we have enjoyed the most during our trips to Mexico, fresh fruit ripened in the southern sunshine springs to mind. Jicama soaked in lime juice, tequila, hot peppers and fresh prawns all bring back fond food memories. I’m lucky that Denis is able to harvest our own spot prawns minutes from our home. I think of the following recipe as a blending of two geographic regions: fruit from warmer climates in the south and seafood from the cool waters of the Pacific Northwest. Why should you make this Southwestern Fruit Salad? If you’re using fresh-caught prawns, they are naturally sweet and need nothing added to them. 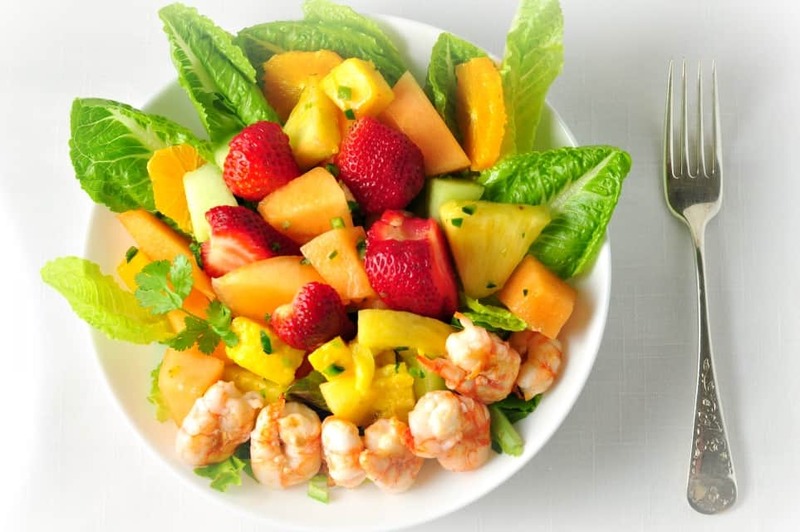 If you are using prawns or shrimp from the South Pacific, just season them by drizzling them with a little more of the tequila lime dressing. 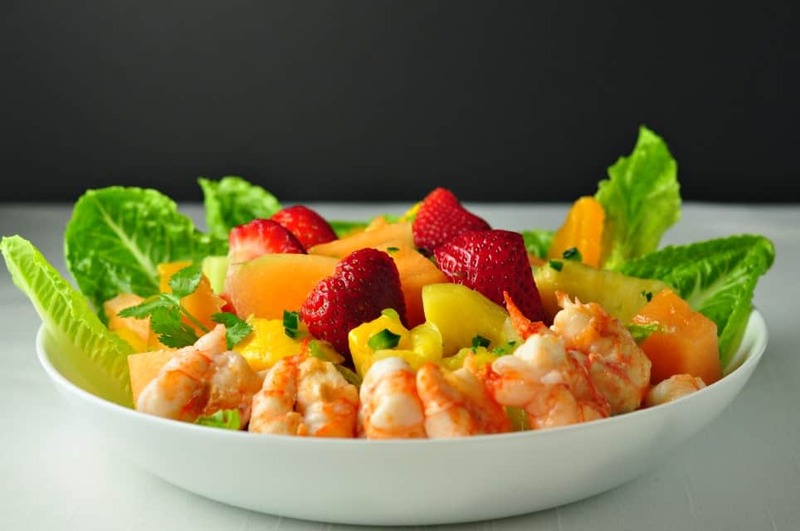 Enjoy this salad of sweet colourful tropical fruit tossed in a piquant cilantro lime dressing flavoured with honey and tequila. 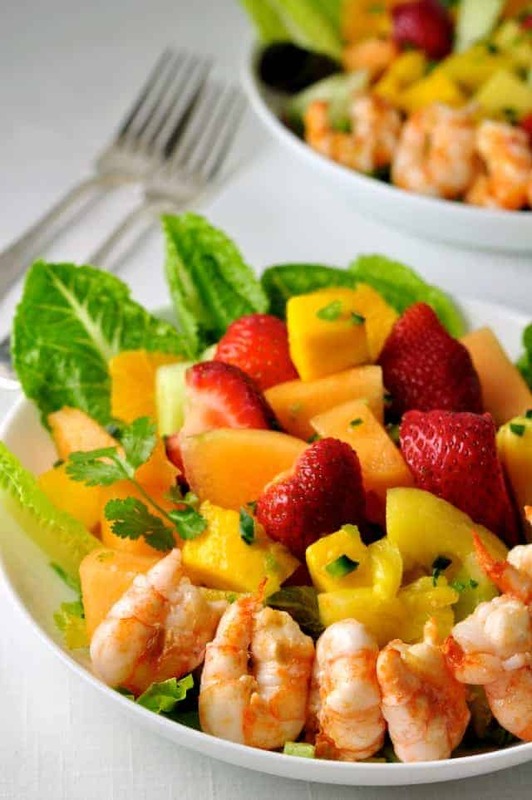 Add fresh grilled prawns to make it a complete meal in a bowl. Combine lime juice and zest, honey and tequila in a food processor. Pulse to combine. Add cilantro and process until smooth. With machine running, slowly add the olive oil. Season to taste with salt and pepper. 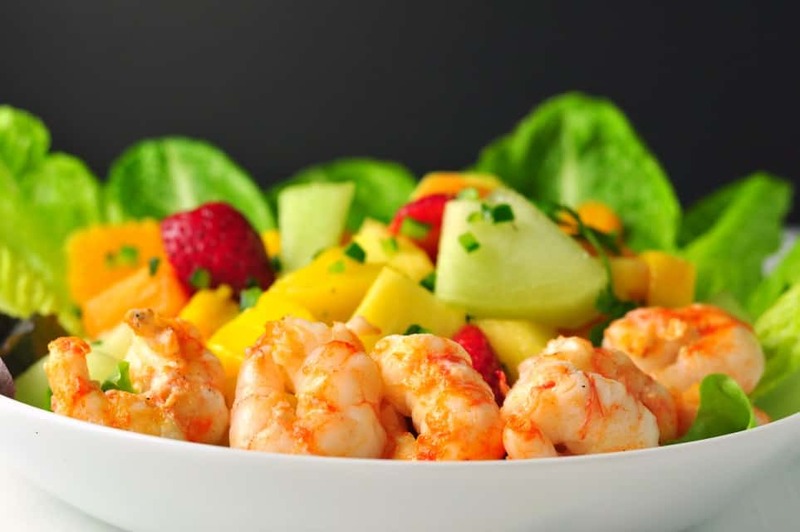 Combine all ingredients except seafood in a large salad bowl, toss with tequila lime dressing, and top with fresh grilled prawns or shrimp. An ancho chili is a dried poblano pepper. Poblano peppers are quite mild. Ancho chilis have much more heat.